Today's post is a topic I've wanted to write about for a while... Adults reading middle grade titles. I feel like nowadays it is definitely more 'acceptable' to be an adult reading YA fiction, however not quite so for an adult reading MG fiction. Three years ago now I picked up my first middle grade book to read as an adult, and I distinctly remember the book also - The Girl Who Walked On Air by Emma Carroll. I was absolutely enthralled in the story and felt like it was filling a reading void that I'd been experiencing. Having now read more and more middle grade books, I understand exactly why it is that I love MG so much. Prior to picking up a middle grade title, alongside reading adult fiction, I read books aimed at a young adult audience. Whilst I do still read the occasional YA title, I had struggled with various genres within the YA bracket as so many of the books feature romance, and as a reader I'm just not that interested in that. I'm a big fan of reading about relationships, however those of the friendship variety and family bonds also, and these themes play a large role in middle grade titles. There is so much more to MG than relationships of course, with the imagination, adventure and curiosity being other elements I enjoy. There are some truly amazing books to be found within the middle grade section of a bookstore/library, and some really talented authors. Just because a book is aimed at a younger audience, that doesn't mean it can't be enjoyed by an adult - an adult wrote it after all. Judgement and book snobbery are a real thing, sadly, however I'm a firm believer in reading what you want to read & what brings you joy... I'm an adult, and enjoy reading middle grade fiction. And I'm not the only one! I took to the blogging community and here are what others have said about being adults who read middle grade fiction. You can find Jennifer on her blog - Book Den - where she shares all things bookish as well as on Twitter. BookwormTheatreMouse blogs about books & more and can be found on Twitter too. Over on Book By Book Sue shares not only her own reads but that of her family too. She also regularly reviews MG titles, which you can find here. Sue can also be found on Twitter. As well as having other readers of middle grade books contributing to this post, I'm incredibly honoured to also be sharing a few words by EMMA CARROLL - my favourite MG storyteller - on why she writes books for a middle grade audience. Emma Carroll is a former English teacher turned full time writer, with her most recent middle grade title - Letters from the Lighthouse - being published earlier this year. If you're an adult who reads, or writes, middle grade fiction, then I'd love to hear your thoughts! I’m an adult who reads middle grade. I like it because the books are imaginative and not romance-focused. I can also read them really fast, so they help me catch up on my Goodreads goal whenever I’m behind. We share similar thoughts regarding middle grade titles then, AJ. Thanks for sharing! Wonderful post, Jade! I love that you are sharing your reading experiences & spreading the word about middle-grade books! Besides enjoying MG books myself, I often recommend them to those with chronic illnesses who struggle with cognitive problems and can't read a lengthy or complex adult novel anymore - MG books are often the perfect solution to allow these people to enjoy reading again! Thanks very much for including my thoughts and links in your well-written post! 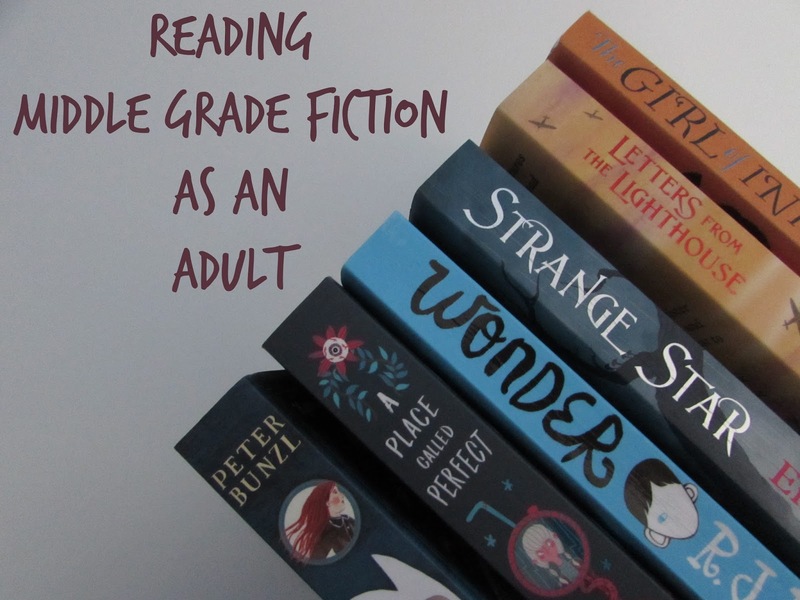 Thank you Sue - for being a part of this post & such an advocate for MG titles. Thanks for sharing your thoughts. I haven't read MG in years; I read a few while taking a college course in Children's Literature and enjoyed the books. I did pick up an MG title from a favorite author who chose to write a book for that age group, and I was pleasantly surprised by how much I liked it. It's interesting reading a title from a loved author who transitions to a different audience - I'm glad that was a successful reading experience for you! Great post! I really love Middle Grade though it's a genre I overlook frequently. I've tried to fix that by designating the first Monday of every month for an MG review. I think I love the adventure stories that you find in MG. I get swept up in the magic of it all. I've found I really love older MG stories like Elizabeth Enright's Melendy family or Roald Dahl's Matilda but I've really loved some modern MG books as well. For the most part I don't read much YA. I love children but I'm iffy on teenagers! 'I love children but I'm iffy on teenagers!' - haha, that did make me chuckle, because I can relate! I've really been enjoying your monthly MG reviews Katherine. I think it's great that you're making time for books you enjoy but don't often pick up from the pile. Middle grade being off your radar before is definitely how I felt when my MG journey began - all these brilliant books I'd been missing out on! And I love that you have such a passion and love for picture books now; I love reading your posts but especially those on children's books. Haha - research, yeah! You know I've gotten really good at decluttering my books, however I keep all the MG books I read because I'm so excited to be able to share them with my son in the future. I love middle grade books, too. That is definitely the most dangerous area of the library or bookstore for me. Middle grade books are amazing. They tell such good, poignant, funny stories. I'll have to check out Emma Carroll's books. I haven't read anything by her yet. Oh Julie, I think you'll adore Emma Carroll's books. I think some people will always judge, but you know A good story is a good story, I always think. And you're right- not every story HAS to have a romance. I like that MG's look at friendships and family bonds- so true. I wish I remembered the quote I'm thinking of- you may have seen it- it was by maybe CS Lewis. Sorry! But to the effect that childrens stories are good for kids but also for adults to come back to and appreciate. I'm skewering it but I think that's so true. I think keeping the childlike sense of wonder, or not letting ourselves get so "adult" that we can't enjoy a good story, is important. And I totally agree with your thoughts here. Thanks for sharing! I really enjoyed your post. I too love reading middle school books. I read picture books and YA also. I have found that YA books lately are leaning towards romance and fantasy. I find middle school books are more focused and the pace is faster than adult books. I also believe that there has been an increase in middle school books being written and the subject matter is deeper than in the past. I'll take Pax, Finding Perfect or Mayday any day instead of some long drawn-out adult novel. The pace of MG books is something that gravitates me towards them also. I've had my eye on Pax for a while now but have still yet to read it! Great topic. I don't review many of them on my blog, but I enjoy middle grade books too. I'm thrilled that my son is finally at the age where we can read them together. Ah, that's lovely that you're able to enjoy middle grade books with your son. I personally love them because I feel like you cannot find that kind of substance anywhere else. It focuses on interesting worlds and imagination. A lot of them have magical realism in it and I have seen quiet a bit beautifully written MG novels that can be atmospheric and lovely. I love the focus on family bonds in them also. Family bonds & magical realism are two elements I enjoy in MG - I see why you like them Lily.